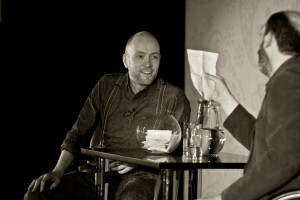 Latest news from Magicians.co.uk» Blog Archive » A weekend with Derren Brown, David Blaine and Dynamo! The Session is an exclusive gathering of magicians that takes place once a year somewhere in the UK. Organised and curated by Andi Gladwin and Joshua Jay, it has a reputation as one of the finest magic gatherings worldwide. Last weekend saw the 10th Session with an extraordinary gathering of international talent including Derren Brown, who was this year’s guest of honour, David Blaine, Dynamo, Troy, Ben Hanlin, Juan Tamariz, Chad Long, Rune Klan, Michael Webber, Luke Jermay and Roberto Giobbi whose presentation on the life and work of legendary 20th-century magician Dai Vernon was for us the highlight of the convention. Congratulations to the entire team at Vanishing Inc. We can’t wait for next year.